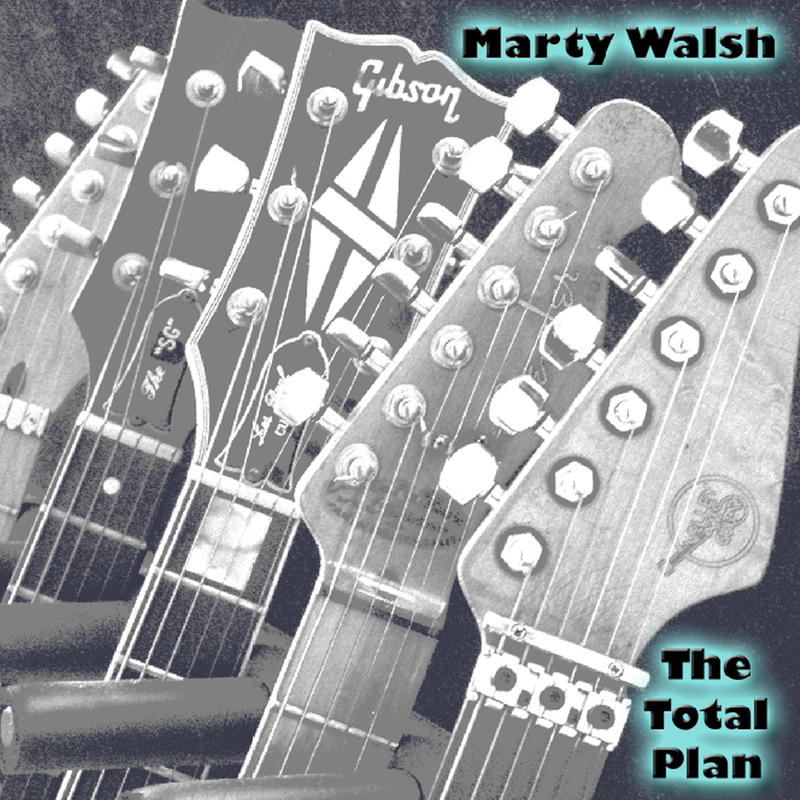 Boston, MA – Much to the excitement of guitar aficionados across the globe, celebrated guitarist Marty Walsh released his eagerly awaited debut instrumental solo album ‘The Total Plan’ on June 16th 2014! Making the release even more thrilling is the array of guest artists appearing on the release – Billy Sherwood (YES/CIRCA:), John “JR” Robinson (Rufus, Eric Clapton, Mike Oldfield/Steve Winwood) and a multitude of LA Studio Legends. Marty Walsh is an assistant professor in the Ensemble and Music Production departments at Berklee College of Music in Boston, MA. A veteran of the LA studio music scene, he has worked as a guitarist with some of the biggest names in the business. The early 1980s found him on the hits “9 to 5” by Dolly Parton, “She Works Hard For The Money” by Donna Summer, and “Heartlight” by Neil Diamond, to name a few. He also recorded with John Denver, Eddie Money, Kenny Rogers, Sheena Easton, and Julio Iglesias, among others. In 1985, Marty played guitar on the Supertramp album ‘Brother Where You Bound’ and then toured with the band in 1985-86 and again in 1988 after playing on their 1988 release ‘Free As A Bird’. Continuing to do recording sessions into the 1990s, he also was a part of the live band on the Nickelodeon Television show ‘Roundhouse’ which was critically acclaimed and ran from 1992 through 1994. In the late 90’s Marty played guitar on numerous Curb Records releases including three of Leann Rimes’ albums, ‘Sittin On Top Of The World’, ‘Leann Rimes’ and ‘I Need You’, whose title track set the record for weeks (54) in the top 40. Most recently, he can be heard on the Freddie Jackson single “Until The End Of Time”, which reached the number 1 spot on Billboard’s R&B charts and stayed on the charts for 26 weeks. And now much to the anticipation of guitarists and musicians everywhere, Marty is releasing his first (instrumental) solo album ‘The Total Plan’! In support of his new CD release Marty has been working with a videographer, trying to determine which songs would be good choices for music videos and how to approach that. He is also currently working on putting together the personnel for a live band. Although, since the record has so many different people on it, putting a band together that can play all of his music live is a bit of a challenge. The good news is that being in Boston and teaching at Berklee Marty have access to some unbelievable young talented musicians that will most likely be the members of this group. Also his son Ian played some keyboards on the record, and wrote a few of the pieces with Marty, so he is kind of a cornerstone to the live band.